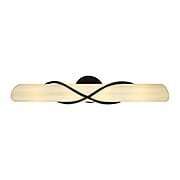 Swank and modern, our eclectic Mid-Century bathroom lighting features futuristic styling and sleek designs. Choose a multi-light sconce to create a stylish bathroom vanity light, or install one of our ceiling lights for better illumination throughout the entire bathroom. Inspired by classic cars of the 1930s and 40s, the streamline Winton 2-Light Wall Sconce adds a retro flare to your kitchen or bath. The grill-like design features bands of bright polished chrome or soft brushed nickel wrapped around an opal glass insert. Made of heavy-duty forged steel, it is both sleek and sturdy. Designed for horizontal installation only. Inspired by classic cars of the 1930s and 40s, the streamline Winton 4-Light Wall Sconce adds a retro flare to your kitchen or bath. 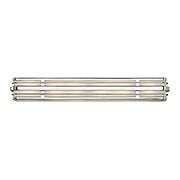 The grill-like design features bands of bright polished chrome or soft brushed nickel wrapped around an opal glass insert. Made of heavy-duty forged steel, it is both sleek and sturdy. Designed for horizontal installation only. The Birone Collection brings a touch of glamour to your bath or powder room. 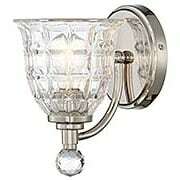 This wall sconce features a sparkling faceted-glass shade anchored with a matching finial and gleaming finish. What an elegant lighting solution for any décor! The Hollister 3-Light Bath Fixture offers a fresh interpretation of the traditional candle sconce with shade. Inspired by Art Deco designs of the 1930s, it translates classic elements into bold geometric shapes, perfectly rendered in etched white glass and polished chrome. 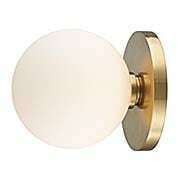 Tapered shades of etched opal glass create a warm and flattering light - perfect for your powder room or bath. Cool, sleek sophistication is written all over this retro design. 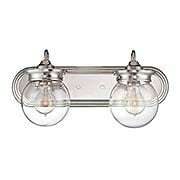 The gleaming glass accents and shiny chrome finish bring a Mid-Century sensibility to your home. An opal etched-glass shade casts a soft, even light - perfect for the dining or bedroom. 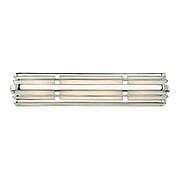 1960's style grillwork was the inspirated the Lanza 3-Light Bath Sconce. Its crisp grid of intersecting rectangles is softened by etched-opal glass shades, creating a bright, diffused light. This unique geometric design is ideal for your powder room or bath. Choose from brushed-bronze or antique-nickel finish options. Inspired by classic cars of the 1930s and 40s, the streamline Winton 6-Light Wall Sconce adds a retro flare to your kitchen or bath. The grill-like design features bands of bright polished chrome or soft brushed nickel wrapped around an opal glass insert. Made of heavy-duty forged steel, it is both sleek and sturdy. Designed for horizontal installation only. 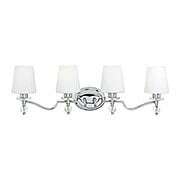 The Birone 4-Light Bath Sconce brings a touch of glamour to your bath or powder room. 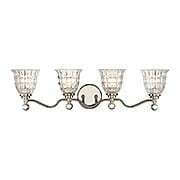 This wall fixture features sparkling, faceted-glass shades anchored with matching finials and a gleaming finish. What an elegant lighting solution for any decor! The Ashley Lighting Collection is an exciting addition to your kitchen or bath. Inspired by the Machine Age aesthetic of the 1930s, these fixtures are bold and geometric, with a futuristic flare. Brilliant chrome plating and a cylinder glass shade complete the period look. 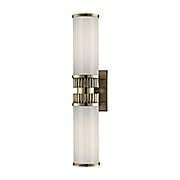 Gleaming and futuristic, the Midtown series recalls French Moderniste lighting of the 1930s. Blending satiny brushed nickel and faceted tubular glass, this sparkling sconce is a stunning choice for Deco or contemporary interiors. The Ashley Lighting Collection is an exciting addition to your kitchen or bath. Inspired by the Machine Age aesthetic of the 1930s, these fixtures are bold and geometric, with a futuristic flare. Brilliant chrome plating and a cylinder glass shade complete the period look. May be installed with shade facing up or down. 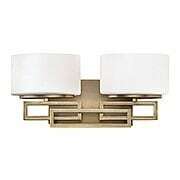 1960's style grillwork inspired the Lanza Single Sconce. Its crisp grid of intersecting rectangles is softened by an etched opal-glass shade, creating a bright, diffused light. This unique geometric design is ideal for bath, bedroom, or hall. Choose from brushed-bronze or antique-nickel finish options. 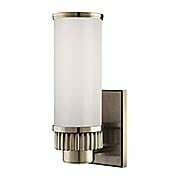 1960's style grillwork was the inspirated the Lanza 2-Light Bath Sconce. Its crisp grid of intersecting rectangles is softened by etched-opal glass shades, creating a bright, diffused light. This unique geometric design is ideal for your powder room or bath. Choose from brushed-bronze or antique-nickel finish options. Inspired by the Machine Age lighting of the 1930s, the Harper 2-Light Bath Sconce is a dynamic way to update your bath or powder room. This sconce's expanse of opal glass boldly contrasts with the gear-like design of its base, creating a truly eye-catching accent. 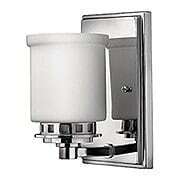 When used on either side of a vanity mirror, it provides even lighting, making it an ideal task light. 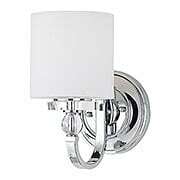 Our Bennett 1-Light Wall Sconce brings a splash of glamour to your bath. A petite arched arm and latch brings an artisan touch to this transitional design, while crosscut Holophane glass adds a dash of vintage panache. 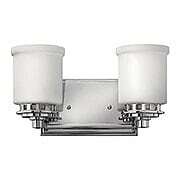 The Downing 2-Light Bath Sconce is a delightful mix of traditional and contemporary. 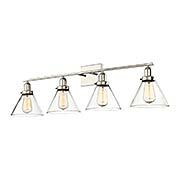 This minimal design features a gleaming finish, large clear-glass globes, and industrial influences. Ideal for a variety of bathroom styles. 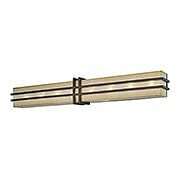 The Drake 4-Light Bath Bar allures with its sleek design and traditional influences. Choose from two popular finish options. Inspired by the Machine Age lighting of the 1930s, the Harper 1-Light Bath Sconce is a dynamic way to update your bath or powder room. This sconce's expanse of opal glass boldly contrasts with the gear-like design of its base, creating a truly eye-catching accent. 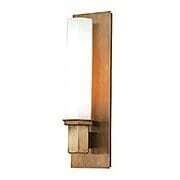 When used on either side of a vanity mirror, it provides even lighting, making it an ideal task light. The Hollister 4-Light Bath Fixture offers a fresh interpretation of the traditional candle sconce with shade. Inspired by Art Deco designs of the 1930s, it translates classic elements into bold geometric shapes, perfectly rendered in etched white glass and polished chrome. Tapered shades of etched opal glass create a warm and flattering light - perfect for your powder room or bath. 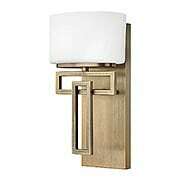 This three foot wall sconce is a dynamic blend of Arts & Crafts, Art Deco and Mid-Century design influences. The silhouette is bold and geometric, yet softened with caramel silk glass and a distressed Cimarron bronze finish. 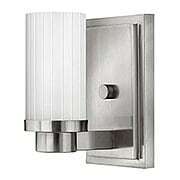 The Walton bath sconce brings modern flair to any bath or powder room. Its hexagonal shaft of opal glass rises from the metal pedestal, set against a full-length backplate. The thoughtful design disguises all mounting hardware for zero distractions from the fixture’s sleek silhouette. Choose from five classic finishes. The Roxbury collection is a fashionable mix of a clean design and top-quality materials. 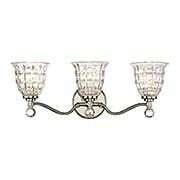 This bath sconce features a sleek, cylinder-like silhouette wrapped by a hand worked, wrought iron frame. 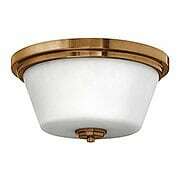 With French-iron finish and Provence-glass shade, it lends a warm, flattering light to any bath. A swank, modern look inspired by the sleek , mid-century homes of Southern California. The bold and geometric frame is made of solid, chrome-plated steel, with genuine lead crystal accents. 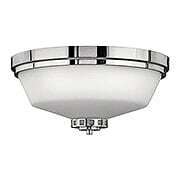 A white linen glass shade offers textural contrast and provides the perfect soft and flattering light for your bath. 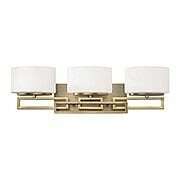 The Birone 3-Light Bath Sconce brings a touch of glamour to your bath or powder room. 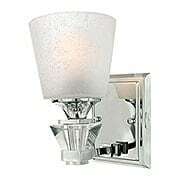 This wall fixture features sparkling, faceted-glass shades anchored with matching finials and a gleaming finish. What an elegant lighting solution for any decor! 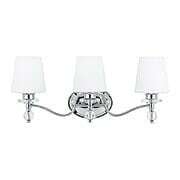 The Ashley 2-Light Sconce is an exciting addition to your kitchen or bath. Inspired by the Machine Age aesthetic of the 1930s, its features are bold and geometric, with a futuristic flare. Brilliant chrome plating and a cylinder glass shade complete the period look. May be installed facing up or down. 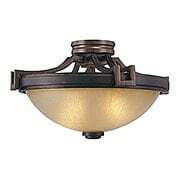 This semi-flush ceiling mount fixture is a dynamic blend of Arts & Crafts, Art Deco and Mid-Century design influences. The silhouette is bold and geometric, yet softened with caramel silk glass and a distressed Cimarron bronze finish. 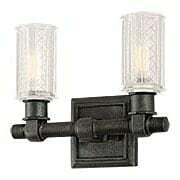 The Vault Wrought Iron 2-Light Vanity Sconce brings industrial style to modern baths. The frosted, pressed-glass shades, featuring a diamond motif, are horizontally connected by heavy-duty, threaded brackets. Designed for use over a mirror or vanity, this sturdy sconce is constructed from hand worked wrought iron and finished in aged pewter. ADA compliant. The simple design of the Baird Collection adds a playful twist to your powder room or bath. 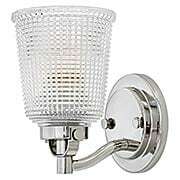 An orb of light, made of etched glass, floats effortlessly on the round metal back plate of this delightful bath sconce. The result is a flattering diffusion of light. 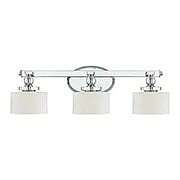 Cool, sleek sophistication is written all over the Downtown 3-Light Vanity Fixture. Gleaming, glass ball accents complement the opal etched-glass drum shades and shiny chrome finish - bringing a soft, modern sensibility to your bath or powder room.